Carrying out your lifelong dreams and doing what you love is quite difficult for some people to do if they don’t have the time or money put aside to tackle their desired projects. Some of us ‘do what we know’ for a good paycheck—and that’s fine. We all have to make ends meet. Natalia’s post inspired me to write something along these lines. Her post today really sparked something in me that’s been brewing for quite some time. From struggling with school to hopping from one career to the next, my path for ‘success’ determined what job I landed. I hated most of my jobs, and tolerated others. I had to make money and have good benefits. This is what was told to me. This was reality; this was life. You need to survive. I can’t just sit here and paint, draw, sketch, play guitar and write all day…can I? I had to be jammed up in a cubical taking calls from nasty customers complaining about a .03 cent increase in their phone surcharge. Anxiety attacks and depression plagued my mind and numerous medications were tossed at me for the doctor’s satisfaction for kickbacks. I was just a number. I had to work in order to be ‘okay’ in everybody else’s eyes. I had to be 'employed' at a reputable company in order to be someone; to be worthy. What exactly is acceptable in people’s eyes? Whenever someone hears ‘unemployment’, it’s an automatic stigma for the word, “bum”. “Ah, he/she’s just lazy and doesn’t want to work." The entire time I was unemployed and trying to get better, I saw their reactions—I heard their words. “A job doesn’t make you…’you’ make the job…” as Madelene always told me. “Well what do you want to do?” That was always the most popular question asked. I certainly didn’t want to be in accounting anymore, and I didn’t want to be in customer service wishing I was somewhere else. It was pure torture. I wanted to live life, and explore more options. I wanted to write—be heard---tell my story and have people feel as though they’re not the only ones going through certain things and situations. My passion for writing was what reeled me into writing a book and starting a blog. I want simple things in life; I don’t want to be rich. I love to bartend and be around people. I don’t want to be some important executive on the verge of a heart attack waiting to happen. I wanted to live life beyond the bright florescent-lit offices that depressed me so much. I want to work to help others—not help the quotas of a busy call center so revenue can be at its highest. No, I wanted more; yet I wanted less. 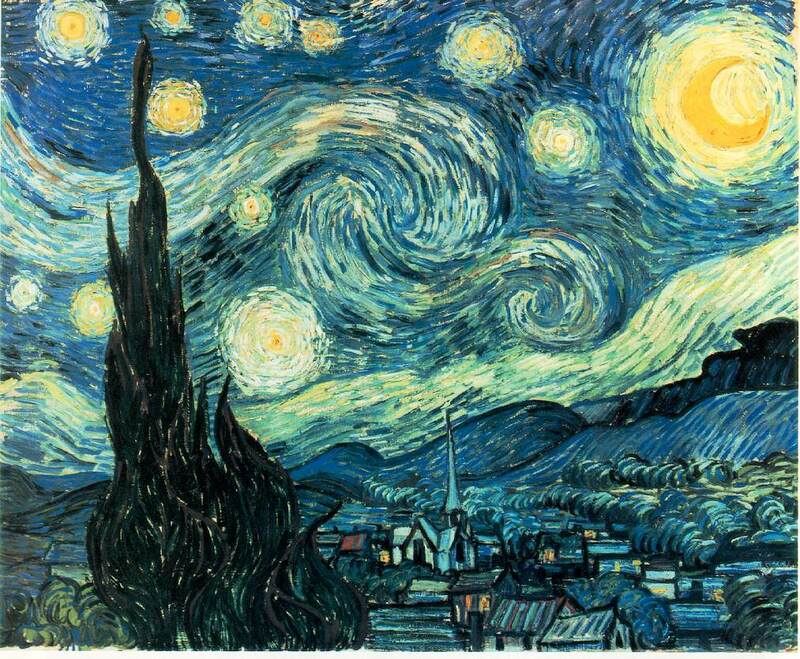 Vincent van Gogh, the famous painter always reminds me of what’s most important—passion for what you do. He suffered greatly from mental distress and had a passion for painting. It’s told that Vincent van Gogh killed himself because no one recognized his talent. His last painting, “Starry Night” was worked on right before his death. He was in a very angry state of mind. He went outside with his paint brushes held to his heart, and walked out into the street and shot himself. Sometimes I feel like doing this myself. Walking outside, holding my guitar, my book, and many other writings, my laptop to which I constantly write in as well as my paintings---and ending it all. Will I do this? …No, of course not, but I can totally relate to what he went through as an artist wishing to do something he loved so dear. So what’s most important to me? Love. My relationship with God, being around my family and the union I have with my partner. I want to enjoy sipping wine overlooking breathtaking views. I want to write and dedicate beautiful words to my lover. I want to play guitar melodies to her—and calm her with my music. I want to spend time with my nephew and nieces. I want to share special moments with my friends—laugh and have a great time. I want to live life. I don’t want it to pass me by as I sit in a cubical entrapped with coils of wire dangling down from the telephone. Even so, I have noticed one thing, at least, that is good. It is good for people to eat well, drink a good glass of wine, and enjoy their work—whatever they do under the sun—for however long God lets them live. I want all this. I want the good things in life—I don’t have to be rich to possess the good things in life, because the ‘good things’ in life don’t have a price tag on them. They’re gifts from God. Your talents and my talents are all gifts from God. We should use them the best we could. I don’t want to wait for retirement to get to travel around the world. I want it now. PETA & Animal Lovers---Do Not Read!